Ladies, Gentlemen, and kids of all ages, welcome to the "Last Giveaway Roundup for July". We hope you've been having a wonderful summer and somehow have managed to beat the heat we've all been feeling. You know with the end of July coming upon us, school is just around the corner, well for us it's less than 2 weeks away, so there isn't much time left to get those last minute vacations, camping trips, and other fun excursions in. So to make those a little better, at least we hope so anyway, we've found a few awesome giveaways around the outdoor blogosphere you don't want to miss out on. First up, over at Backpacker Magazine, they have two sweet giveaway promotions going on. The first is their weekly giveaway. This week they have a Deuter Act50+5 backpack. All you have to do to get in on this opportunity is fill out the giveaway form. Backpacker's other promotion is their 2012 Reader's Choice Photo Contest. Do you have an awesome outdoor awe inspiring photo? Then submit it to backpacker for your chance to win a sweet prize pack from Coleman Repellants (including sleeping bags, a tent, and much more). You have until September 7th to get those photos submitted. 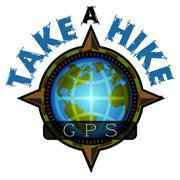 Next up is a great summer giveaway offered by Take A Hike GPS. Starting August 1, they are giving away $5 gift cards to Dairy Queen along with a $10 off coupon for GPS Rental. I can't think of any better cold treat during these Dog Days of Summer than a cold ice creamy treat from DQ. I hear they have Mary Lou Retton in a Pinata. Go figure.Anyway head over to Take A Hike GPS's blog for all the details on the contest. Moving on, Eagles Nest Outfitters (ENO) has a wonderful promotion going on called the ENO Summer Lovin Giveaway. The prize pack includes a Doublenest, slapstraps, hi-fi speakers, a t-shirt and stickers. Check out their blog post on the giveaway for all the details on how to win and help your friends become ENOless. Lastly, you may remember me mentioning something about a huge giveaway starting on August 1st by Outdoor Informer and Camping Gear TV. 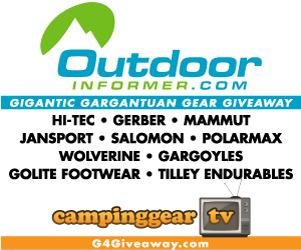 That's right starting on Monday, you can enter daily for your chance to win one of five great outdoor gear packages in the "Gigantic Gargantuan Gear Giveaway" (G4). Head over to either Outdoor Informer or Camping Gear TV to get the low down, or just wait until Monday and head to the G4 giveaway site to get entered. Trust me, you don't want to miss out on this one. That's it for the latest giveaways, just to remind you, we have our own giveaway going on, you have until tomorrow at midnight to get entered so don't wait any longer. Outdoor Informer still has their ENO Prize pack up for grabs you only have a couple more days to get entered. PAHikes.com still has that pocket chainsaw up for grabs as well, so hurry on over and get entered for that one too. We hope you all have a wonderful weekend and those of you who's kiddos start back to school in a couple weeks, squeeze as much fun in these next couple weeks as you can before school starts back.